Very nice. I like the slight rake too. Looks like those 275s out back are the 50 series, not the 275/ 60/15s. Just wanted to clarify. What size wheels did you get? Thx! After measuring with an actual tape measure, it lowered 2 inches. Cant remember the exact profile size of the rears (car is in the garage and Im at work) but its def 275 wide. The actual specs of the tires are posted back in this thread if you need the exact details. I went with stock sized width rim up front but did an 8" wide rim in the back to accommodate the wider tire. Another blk car with prostars. 7" front/8" rear, 3.5" backspace for both. Man your car is finer than frog fur! Absolutely stunning!!! Love the white and the wheels and stance are beyond perfect! Great job on an awesome looking ride!! Please pardon my drool!!! That looks killer. My personal favorite on a GN. LOL! Well, at least you can tell her that you’ve got great taste in “side stuff”!! Cause it doesn’t get any better than that!! When you get a chance can you edit your post with wheel and tire sizes and backspacing along with suspension setup as well? Thanks, that way I can make my car look as righteous as yours. I have that same brake set up on my GN. I want to order CCW but I want 20s and they dont make them.... 18’s will not clear my drive way. Very clean car! Much better with the silver/black caps. Looks great. Here is my current car "Legend". I lika... do da cha cha. Billet Specialties Vintec - 16 x 7 front and 16 x 9 rear... both at 0 offset, BfGoodrich Sport Comp 2 tires, 215/55 front and 255/50 rear. TRZ suspension arms and lowering springs were on the car when I bought it, wish I knew who made the springs, I'd be glad to share the info. what is the wheel bore on the turbo Buick? Vision Nitro's 15x7 front, 15x8 rear. Gloss black centers, polished lips with clear coat from Vision. Tires are Hankook Optimo H724 in 225/70R-15 front and M/T ET Street S/S drag radials in P255/60R-15's out back. 1.4" long black lug nuts and aluminum bolt in style valve stems. This setup is a true 27" tall all around setup. I will be installing TR Custom Parts' engraved black with silver outlined Power 6 center cap overlays this weekend. - Lug nuts sit deeper on the 15x7's than on the 15x8's. - Center caps are different lengths between the 7's and 8's, but equal when installed. - No wheels spacers needed on the rear, vs the Aluma-Stars. - No rubbing on hard turns or big bumps. - Fantastic ride quality with this setup. - No fear of getting caught in the rain. 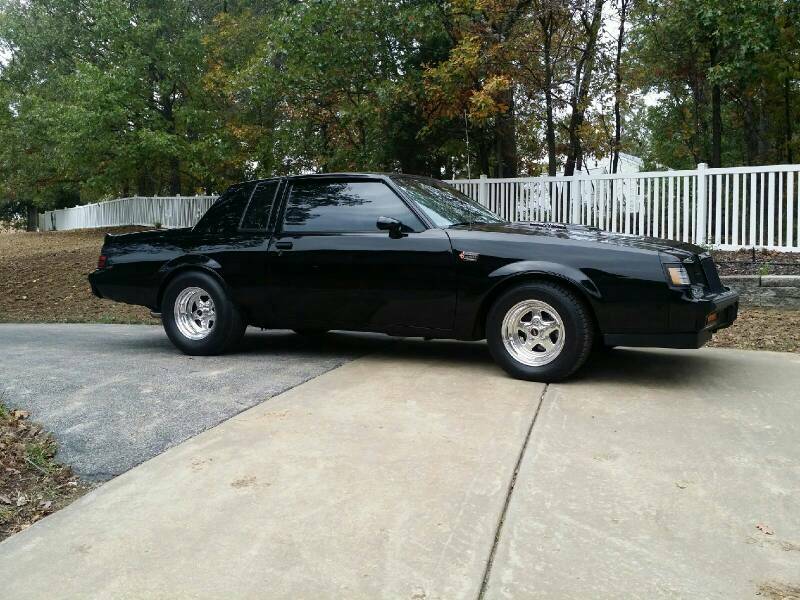 18x9" Gbody GNX front, 19x9.5" rear Gbody GNX wheels. all the information is listed in the forum. There are multiples. Mine is the 18x9, and 19X9.5"
Hey Man, new wheel package looks great! However, the link just goes to GN / T-Type Central and no post or page in particular? So, what are the stats? Any rubbing? I have the same wheels although I went with the 18x9s in the rear (18x8 front) with a 285/40 drag radial. No rub whatsoever.